Perfect for the little engine driver in your life! 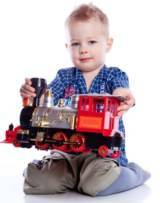 Many toddlers love trains and Thomas the Tank Engine from the popular books and tv series is a particular favourite. All the ideas below are easy to do and great fun. Perfect for train-mad toddlers and slightly younger children. For younger children you do not have to be too sophisticated with this. Your invites should simply have a nice picture of a train on them. If you are crafty it is quite easy to make cut-out invitations where you have to open the engine shed door to find the party details. Or you could have a picture of a train with the train party details written along the sides of the carriages and trucks. There are all sorts of posters and train party decorations available from party stores. It is also easy to make your own. Download and print railway pictures and stick them around your venue. Train cut outs / silhouettes can be made from construction paper and stuck to the walls. You may like to make your party venue a mock railway station with signs to the ticket office etc. Many traditional kids party games can easily be given a train makeover. Its all about having some fun and using your imagination. This is a simple but fun way to start your train party. 4 Pictures of trains. These should be different colours. Alternatively they could be four characters from Thomas The Tank Engine. You need 2 pictures of each train. A4 size pictures printed on card are perfect. One of each of the 4 posters is put on the wall in the four corners of your party venue. You could also put them on the backs of chairs positioned in a square in the middle of the room. The children are trains and puff about in the middle of the room. When you - The Station Master / Guard / Fat Controller (for Thomas fans) blow your whistle all the trains have to go to one of the engine sheds for the night. For young children Mum can be a train and go too of course. You then select one of the 4 remaining train pictures and hold it up. Any trains that chose the right engine shed win a small sweet. Then all the trains go back in the middle and you repeat the whole thing. Don't think this is too simple, young kids like games they understand. We guarantee this will be a winner! In advance make up some simple trains. You can see from this picture that this is not difficult. You can easily find and download good pictures from the internet. Cut them out and turn your boxes into trains. Attach a long string to the front of each one. The trains are positioned at one end of the room. the children have to then run and load either their passengers or goods. They then run back and use the string to quickly haul their train towards them. Organise your races with as many kids as you have trains. You could set up a little knock out competition but may prefer just to let everyone have a few goes for fun. Extra: You may like to prepare bank sheets or sheets to be coloured in as an activity for when the children first arrive. A quick bit of adult help with a stapler and these are then used to make up your trains. This is a train version of musical chairs. Arrange chairs or cushion in twos as if on a train carriage. For ease it might be easier to have them all in a line of pairs facing toward one end of the room. The very first seat is a single for the engine driver. The kids run around the outside of the train carriage in time to some suitable train themed music or they could puff around like steam trains. When the music stops and on your whistle they have to find a seat on the busy train. After a few practice goes anyone who can't find a seat is out. Remove a seat each time until there is only the engine driver left. The pictures are stuck to the floor with tape or blue tack. The young trains puff about while suitable music plays. But when the music stops and the Guards blows his whistle they have to jump onto an engine shed. After a few practise tries remove an engine shed each time. The train who can't find a shed is out. Continue until one train remains. This is another simple game that young kids love. Its even more fun if Mum and Dad join in too. Everyone is a train driver. Line your trains up in lines with a bit of space between them so everyone has plenty of room. You are the trainer and standing at the front are going to call out a series of actions for the trainee drivers to practise. Show them the actions for each call in advance or guide them as you call each one. If you run through once as a practice the second time is usually a lot better. Down the other side - Nice quick puffs as you come down the hill again. Sound the whistle - Pull an imaginary whistle, train driver fashion, and shout "Whoooo Whooooo!" Cow on the line - Everyone makes cow horns with their fingers and shouts "Moooo!" Stop at the station - Everyone stops with a lot of puffing. Over the rickety bridge - The trains bump over the imaginary rickety bridge. This really is a train version of the party favourite The Hokey Kokey. Thats what its all about!